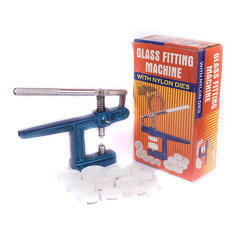 Glass Fitting Machine with Nylon Dies is an essential tool for watchmakers for fitting watch casement backs and glass. Dimensions: 2 5/8" x 1" x 1/2"
- Rado back fitting available with "8 nylon dies". Available with us is a premium assortment of Watch Case Tools that are known for their sturdy construction and longer service life. These case tools are manufactured by our technocrats utilizing quality-assured raw material. With enriched domain experience and knowledge in the relevant field, we are manufacturing, exporting and supplying a wide assortment of Water Tightness Machine. our watch making tools are manufactured with optimum quality raw material sourced from reliable vendors of the market. These are designed in compliance with international standards and are known for superior quality and durability. A very popular series of screwdrivers that features color-coded hex heads and reversible blades. Blades are tempered and finely ground to exact specifications. Tweezers For Watchmakers Set Of 5 Pcs. Crowns Waterproof Yellow assorted of Short, Medium & Long Pipes (pkt of 100). A quality range of precision screwdrivers. Combination tool and driver sets have carbon steel blades (tweezers are stainless steel). Driver only sets have nickel chrome molybdenum alloy steel blades. All with attractive chromed handles. We are one of the trusted companies of Watchmakers Screw Drivers, Our products are enormously admired in the market owing to their top features. 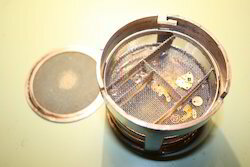 We are renowned company in making Watchmakers Loupe , It is very inconvenient to use traditional clock magnifiers which need to be clamped by eyelid and may affect the repair quality of precision instruments and clocks.